Today Facebook will begin rolling out a new campaign structure that will make it easier for advertisers of every size to organize, optimize and measure their ads. Up until now, Facebook’s campaign structure has consisted of two levels — campaigns and ads. 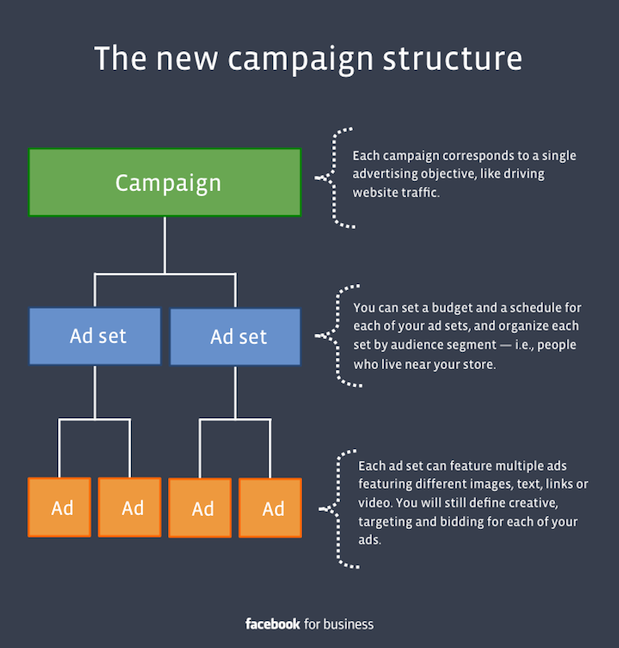 The new campaign structure consists of three levels: campaigns, ad sets, and ads. Campaigns correspond to each of your advertising objectives, like building brand awareness or driving web traffic. They’re designed to help you optimize and measure your results for each objective across multiple ad sets and ads. Each campaign can feature multiple ad sets, each of which has its own budget and schedule. You can also organize each ad set to represent audience segments, like people who live near your store. This will help you control the amount you spend on each audience, decide when they will see your ads, and measure their response. The ad delivery system will optimize delivery for the best-performing ad in an ad set. Within each ad set, you can have multiple ads, each of which can feature different images, links, video or text. You’ll still control the creative, targeting and bidding at the ad level. With the new campaign structure, you’ll begin by creating a campaign for each objective. Next, you can create ad sets representing the audiences you want to reach in each campaign. For instance, in the campaign built around driving traffic to your website, you might want to create one ad set for people who are on your email list, and another for people who have expressed interest in attractions near your restaurant. Finally, you’d create ads for each ad set. You can create multiple ads within each ad set, making sure each ad is targeted to the same audience while delivering different images, links, video or ad copy. This can help you learn which ads are resonating with each audience and, in turn, create better-optimized campaigns. The new campaign structure will be reflected worldwide across all ad interfaces, including the Ads Create Tool, Ads Manager and Power Editor, as well as third-party ad interfaces built by Preferred Marketing Developers. When the new structure is rolled out to your ad account, all your campaigns will be migrated automatically to the new structure. The migration will not impact the delivery, spend or performance of your existing ads, and you’ll still have access to historical data for any of your existing campaigns and ads. For more information on the new campaign structure, including additional FAQs and suggestions on how you can prepare for the change, visit the Facebook Help Center.